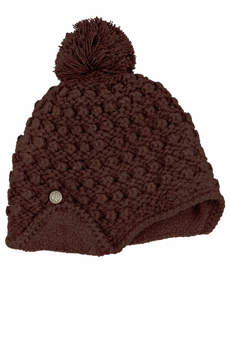 Yumi Bobble knit hat is a fold back bobble hat with pom-pom, fleece lined flaps and can be worn buttoned up or down with rose button detail. This sports-luxe topper will keep you stylish when temperatures drop. Winter collection. Composition: 100% Acrylic. Color: Coffee.